Grub Street never needs a reason to celebrate our city’s esteemed roster of delicatessens, but since this week marks the New York release of the new documentary Deli Man, we’re going all in on the subject today. Charlie De La Cruz has held just about every position at Katz’s Deli, where he started as a busboy just after his 16th birthday. He waited tables, cooked in the kitchen, and manned the grill before finally being allowed to touch and — more important — cut the meat. Sixteen years later, De La Cruz now oversees operations, which means managing the line, the deliveries, and the cutters. 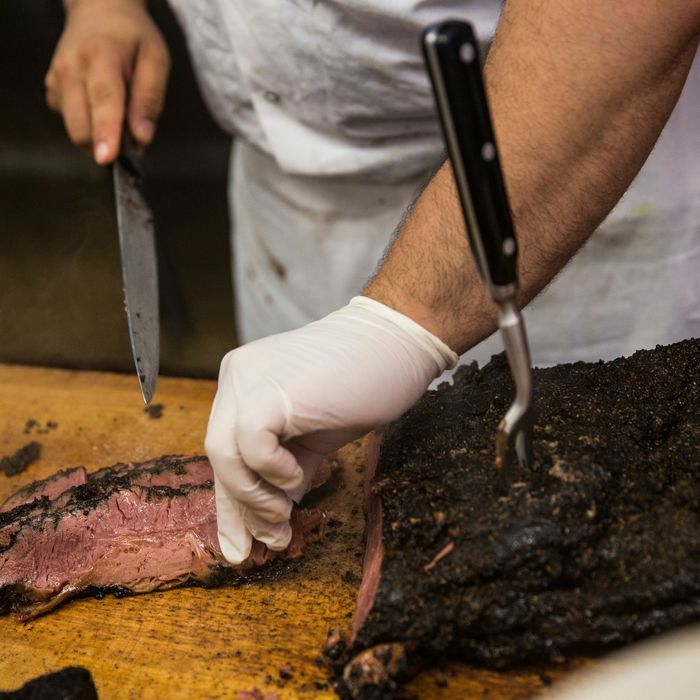 Grub Street spoke with De La Cruz about how long it takes to learn to cut Katz’s famous pastrami, the added value of hand-cut meat, the importance of both tips and pickles, and what, exactly, will happen to you if you lose your ticket. How did you start at Katz’s? A family friend worked here, and they brought me in. Most of the guys come here with a reference, like a family member. My 16th birthday, around 1999, I started working as a busboy part-time. I grew up in the neighborhood and I went to school in the neighborhood. Then I went to the grill. It was a ladder to climb. When I graduated college I weighed out other options, and I stayed here. It was like a family. You eventually became a cutter. Why is that such a coveted position? Most people who come to Katz’s come for a sandwich, and our specialty is a hand-carved sandwich. Older Jewish and Russian men held the position for 20, 30, 40 years. What does the hand-carved meat add to the sandwich? It adds the moistness of a nice, hearty, bite, and the pastrami actually melts in your mouth. Our meats are hot meats, we don’t serve any cold cuts, and they cannot be sliced on a machine. How were you trained to cut the meat? We used to train with Italian bread. When you were first training, they didn’t let you touch the meat because it was too expensive. They used to sharpen a knife for you, and you have, like, an older Russian or an older Jewish guy standing over you. He would say, “Charlie, grab the fork, tilt the fork, make sure your knife is at an angle, slice completely down to the grain, make sure with every sandwich you give them their pickles. No customer is satisfied if they don’t get their pickles, and make sure you put mustard in the bag.” First you are training side by side with them, and you cut. If they like what you’re cutting, then they will use it in their sandwich. After that, they will start letting you take one customer at a time so you’re making sure the quality and the quantity are correct. What did you have to master? Mostly the trimming of the meats with minimal waste, taking the fat off the meat, maneuvering the fork, and making sure you’re slicing it against the grain. You have to make sure you get the right angle so it’s all in one stride, so the bite is like butter and it is not texture-y. How did the tipping get started? The tipping thing was here before I was. But when you hear a lot of old-school customers, they came here and they used to tip, and the cutter used to give them a doggie bag. Any excess fat that was getting cut off the sandwich, they used to wrap up and give it to the customer. Some customers used to get good stuff by bad employees that used to work for their tips. Now I hope it doesn’t happen as much as it did then. It was probably in the ’80s when that it used to happen a lot. We still have some older-generation customers and they’re like, “Can I have my scraps?” But it is just not what we generally do. If you gave your cutter $20, what would happen? It is supposed to be the same as if you gave them one dollar. What’s a fair tip for your cutter? Maybe a dollar for a sandwich, just something that shows appreciation. It is not about the amount, it is about the appreciation that you are taking the job and their skill level into consideration. Do you guys bring your own knives? Ownership provides knives, and certain guys sharpen them. The knives aren’t anything special. It’s not a samurai sword. Just a simple knife that, once these guys sharpen it, is as good as any other. They’ll use the machine once a month and the rod every other day. We replace them every three to four months. The [cutting] boards get changed every two to three weeks. Has there been anything that has changed over the years? Do people order their sandwiches lean now? I feel like the whole world has become more health-conscious. So as of late we have a lot more people that prefer the lean, but if you are an old-school Katz’s customer, you like the fatty part, because that is the part that keeps the most flavor of the meat. Pastrami, as it has always been the top seller. But the closest competitor for the last three or four years is the pastrami Reuben. I think Adam Richman ate that on Man v. Food, and a lot of people now request it. Now, a nightmare scenario: What happens if someone actually loses their ticket? If you lose your ticket and you’re a nice person, we usually find out what you had, and if you speak to us, we’ll make sure nothing happens. But sometimes you’ll get some egos in here, and then we’ll charge you 50 bucks for a lost ticket plus the food. But that all depends on the attitude you come in with.